Not many legends have been able to make an impact so strongly and swiftly like Dutch hero Marco Van Basten. It was quite unfortunate when due to plaguing injuries the Dutch legend had to cut his career short at the tender age of just 28 due to lingering injuries in his towering 6ft 3 inch height. Nevertheless he had made enough accomplishments by then to bow out with his head held high and three Ballon d’Ors to his name – he remains the only player to have won the exclusive trophy three times and all before he hit 30. The striker can be seen as the Director of FIFA, prior to this he remained in soccer post retirement coaching Ajax and the national Dutch side. In November 1992 the striker engraved his name in the UEFA Champions League history books by becoming the first ever player to score four goals in one match against Swedish compatriot IFK. 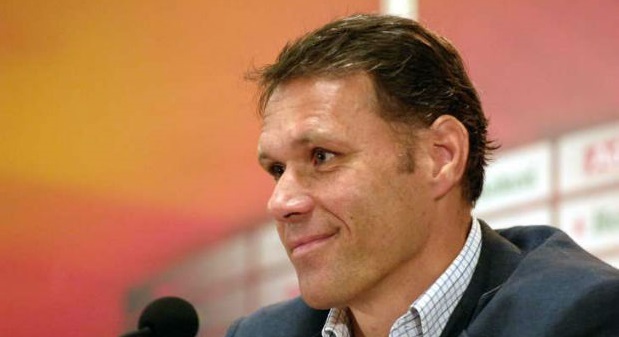 Marcel Van Basten was born on 31 October 1964, in Utrecht, Netherlands. By the time he was seven years old Basten was playing for local side EDO and his talents became quite apparent. Within a year he moved to another local side, the UVV Utrecht where most of his youth career was spent before a brief spell with Elinkwijk Utrecht. By 1981 Basten singed into Ajax and had already established his reputation as one of the greatest strikers of all time. Basten scored 9 goals in 20 league matches within joing the club. It comes as no surpise that Basten became the top scorer in the league for four seasons from 1983–84 to 1986–87, scoring 118 goals in 112 matches. To sum it up, Basten scored 128 goals in 133 matches for Ajax. Basten had gained a reputation for being a sublime player of the game despite his towering height. In 1986 he was awarded the European Golden Shoe after netting 26 times in 37 games. After career defining accomplishments at Ajax Basten joined AC Milan where he was joined be fellow countrymen Ruud Gullit and Frank Rijkaard and all three together became a formidable trio of Dutch talent. It was at AC Milan where Basten injuries started piling up, in his debut season he played only 11 times before taking time off due to injury which was caused by a troublesome ankle. However Basten soon bounced back and scored scored 19 Serie A goals and helped his side to UEFA European Cup final glory against Steaua Bucharest. This same year he won European Footballer of the Year award. These good times rolled into the next year where Basten was again the top goal scorer in Serie A and helped Milan retain its European title in an epic match against Benfica. The then 28 year old was voted European Footballer of the Year for the third time. Basten netted a total of 277 goals during a stellar professional career. Basten was named FIFA World Player of the Year in 1992. He has won the Ballon d’Or 3 times (1988, 1989 and 1992). In 1999, he was ranked 6th in the FIFA Player of the Century poll, 10th in the European player of the Century and 12th in the Wolrd Player of the Century by the IFFHS.